With so many locations to dine in Magic Kingdom, it can be challenging to narrow down the candidates. If you’re looking for a time-tested location, Liberty Tree Tavern might be the winning choice. Read on to discover ten things that make this colonial inn particularly special. In keeping with Liberty Square’s colonial theme, Liberty Tree Tavern is named for Boston’s famous historical landmark. The Liberty Tree was a mighty elm under which colonists planned several notable protests. In times of victory, residents would hang lanterns in the tree’s branches as a sign of celebration. Being that Magic Kingdom’s many lands are masterfully themed, Liberty Square boasts its very own Liberty Tree. Liberty Square’s tree is markedly different, but still inspires its visitors. You’ll find this hefty oak in front of the Hall of Presidents. Hanging from its branches are 13 lanterns, representing America’s 13 original colonies. Can you spot them all? Many park visitors enjoy their table service meals as an opportunity to relax inside, away from the crowds and in the air conditioning. If this is your own approach, you’ll be relieved the moment you walk through the door. While some dining locations can hardly accommodate more than a handful of patrons at check-in, Liberty Tree Tavern offers a spacious waiting area. This may seem like an unusual feature to appreciate, but when the day is hot and every member of your party is some combination of sluggish, melting, or antsy, it can be a real gift. Cast Members are a huge part of your Disney experience. Their ability to buy into the theming of the surroundings can enhance both your experience and your mood! Liberty Tree Tavern was originally a character dining experience, complete with Minnie and Mickey in their finest colonial apparel. While the famous pair no longer make appearances at the restaurant, the incredible cast members still don bonnets, ruffles, and tights all in the name of authenticity. 7. Hear ye, hear ye! When you check in for your meal, the attending Cast Member will ask where you’re visiting from, and not just because they’re friendly; it’s a set-up! When your table is ready, the town crier will summon your party, announcing for all to hear which “kingdom” you represent. Hopefully, you have plenty of hometown pride, because the crier takes their job very seriously! It’s all in good fun… and for historical accuracy, of course. Once you’re comfy at your table, you’ll have plenty of time to soak in the homey atmosphere. The warm wooden walls, brick fireplaces, and old-fashioned knick knacks everywhere really make you feel at ease. Look closer however, and you’ll notice that each dining room (six in all) is themed for a different figure in early U.S. history: George Washington, Betsy Ross, Paul Revere, John Paul Jones, Thomas Jefferson, or Benjamin Franklin. Remember that nice break from the heat we were talking about earlier? Well, Magic Kingdom’s recent addition of alcohol to its table service menus means more options than ever: beer and cider, wine and mimosas just to name a few. Since not everybody is in the mood (or the market) for a spirited libation, it’s good to know that Liberty Tree Tavern also offers a non-alcoholic specialty beverage. Served in a collectible mug, the Patriot’s Slush is a great way to beat the Florida weather and leave with a souvenir to boot! Or, you can always pick sides and sip on a classic tea (you loyalist, you) or a recharge with a coffee (hear-hear). For a taste of American tradition, you can choose to dine family-style with the Patriot’s Platter. This is a great option for all varieties of choosy eaters, as the format is all-you-care-to-enjoy, so favored dishes can be replenished at your request. 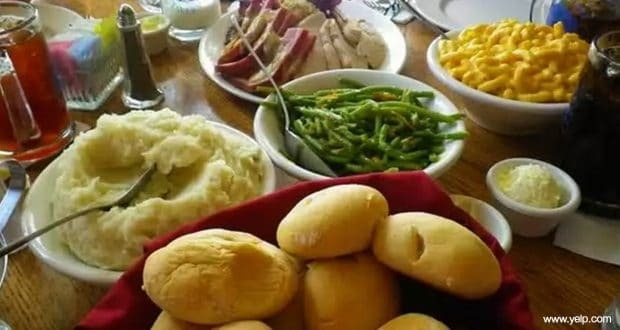 With turkey, pot roast, green beans, and other classic sides included, it’s like celebrating Thanksgiving any time of the year! For the most flexibility, try booking a lunchtime Advanced Dining Reservation (ADR). The lunch menu offers a choice of eating family-style or à la carte, which is great for parties of differing needs. If you have the appetite of all Seven Dwarfs combined, the midday menu does include the aforementioned Patriot’s Platter. Those in need of just a nibble will appreciate à la carte options like fish and chips, pasta, salad, and burgers. Our Tavern Keeper’s Favorite offers a taste of one of the Patriot’s Platter entrées: pot roast. It’s a tried-and-true choice if you can’t put away a full-on feast. Liberty Tree Tavern has several scrumptious desserts on the menu, but their signature is the Ooey Gooey Toffee Cake. This blondie-like masterpiece arrives at your table warm, in a heavy skillet, crowned with an abundance of melty vanilla ice cream. The dish has inspired many copycat recipes online, so you can bet there would be a revolt of colonial proportions should it ever exit the menu! If you’re a parade lover, be sure to check the routes and times before scheduling your meal at Liberty Tree Tavern. If your timing is good and you plan it correctly, you can enjoy some passing floats at the conclusion of your meal. Or, enjoy an afternoon parade from the porch while you wait for an early dinner reservation. The fun of a Disney vacation is the ability to enjoy the magic at any moment! Which of these ten tempts you to pay Liberty Tree Tavern a visit? If you’ve already been, we’d love to know your opinions on this purveyor of time-travel and comfort food. Kinsi grew up visiting the Walt Disney World Resort with her family, and never quite grew out of it. If you ask her, there is truly something for everyone at Disney and she wants to help you find it! After marrying her prince charming, she converted him into a Disney Fanatic as well. Together, they love traveling (and snacking) around the world at Epcot, Disney Cruising, and exploring the resorts.